Note: This series is not meant to diagnose or mollify mental illness or provide medical advice—that responsibility lies with psychiatrists and physicians. The author is not a licensed medical professional. Last week we shined a light on the function and side effects of antidepressants. This week, we take a look at mood stabilizers and medications used to treat symptoms associated with bipolar disorder and schizophrenia. Mood stabilizer is a catchall term referring to any medication that balances mania or intense, sustained mood shifts. Mood stabilizers are also often prescribed for issues such as epilepsy, thyroid abnormalities and even migraines. There several types of mood stabilizers: lithium, antipsychotics, anticonvulsants and valproic acid. Tranquilizers such as benzodiazepines and other medications including calcium channel blockers and thyroid medication are also used to assuage mania and anxiety. Doctors sometimes prescribe antidepressants to treat bipolar disorder, although that practice is becoming more controversial as they are shown to sometimes increase mania and mood cycling. Lithium is the most common treatment for mania associated with bipolar disorder and schizophrenia, but is also used for a range of mental illnesses including eating disorders, depression and alcoholism. Additionally, lithium has been used to treat ailments including epilepsy, diabetes, liver and kidney disorders and arthritis. Lithium’s exact mechanisms are unknown, but it is believed that lithium increases neurotransmitter levels. Lithium’s most common side effects include nausea, dizziness, weight gain or loss and fatigue. It’s also known to cause or intensify skin conditions like rashes, acne and psoriasis. Although lithium is highly effective, the amount entering a patient’s body must be carefully controlled. People on lithium have to take blood tests both before and after the drug is prescribed, especially because it can cause affect kidney and thyroid function and may even cause irregular heartbeats. Additionally, lithium is unsafe for developing fetuses and breast-fed infants, so expectant and new mothers are only prescribed it under close monitoring. People with bipolar disorder, schizophrenia and other mental illnesses often have thyroid abnormalities, particularly hyperthyroidism, so thyroid medication is often prescribed with lithium. Antipsychotics are prescribed to people who experience frequent manic bouts or lose touch with reality during manic or depressive episodes. They are paired with other mood stabilizers, namely lithium. The most widely known antipsychotics include Abilify, Seroquel, Risperdal and Zyprexa. Like other behavioral medications, antipsychotics are known to cause drowsiness, weight gain and sexual dysfunction. They can also cause dry mouth and blurred vision. Anticonvulsants calm hyperactivity in the brain and are most commonly prescribed to people who experience four or more episodes of mania and depression within a year. They’re often used as treatment for intense bouts of anxiety and to treat epilepsy, migraines and brain disorders. The best known anticonvulsants are Depakote, Lamictal and Tegretol. Lamictal has stronger antidepressant properties and is usually prescribed to prevent rather than treat episodes. Like with other behavioral meds, anticonvulsants are known to cause dizziness, fatigue, nausea and weight gain. My experience with Lamictal has included increased thirst and breakouts, although those stabilized in adulthood. Pregnant women are advised against taking anticonvulsants, and some anticonvulsants can affect liver functionality. Valproic acid is used to treat manic episodes associated with bipolar disorder. It can also treat seizures and migraines. Drinking plenty of water and even eating a little is recommended when taking valproic acid. People with existing liver problems shouldn’t use valproic acid, as it’s known to cause liver failure. As with lithium, women who are or may be pregnant or are breastfeeding should avoid valproic acid. Calcium channel blockers, which are traditionally used for heart problems such as high blood pressure, have mood stabilizing properties and are prescribed to patients who can’t tolerate lithium or anticonvulsants. As mentioned above, mental illness and thyroid disorder often coexist, and thyroid medication is often prescribed with mood stabilizers. Note: Mood stabilizers are often prescribed in phases, slowly building up to the recommended or appropriate dose over a few weeks. Similarly, the process of coming off mood stabilizers takes time; rather than suddenly quitting your medication, you’ll need to taper the doses. Technically, benzodiazepines are tranquilizers, but they’re a quick and effective remedy for episodes and anxiety attacks. They take effect within 30 minutes to an hour, and work by increasing the effects of neurotransmitters, reducing the number of neurons that cause stress and anxiety and therefore relaxing the user. Benzos can be prescribed to offset symptoms of bipolar disorder, but are mostly associated with anxiety and panic disorders. They’re also prescribed as a narcotic, especially in trauma-related insomnia. 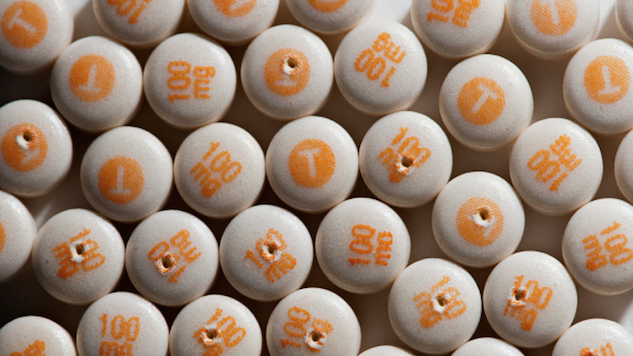 The most common benzos are Ativan, Klonopin, Xanax and Valium. Benzos are tricky little things; they’re highly addictive, so they’re a controlled substance and you won’t be able to get more than one consecutive prescription without consulting a doctor. Rather than for daily use, benzos are prescribed as needed for extreme situations. The immediate effects of benzos are drowsiness (again, this is what they’re supposed to do) and a suddenly increased appetite. After waking up, your brain may feel foggy—if you have time, it’s best to sleep a Xanax hangover off. It’s also common to feel confused and have impaired coordination, so you shouldn’t operate a vehicle until you feel normal again. I’ve been prescribed Xanax for several years and have found that the more often I take it, the more I feel like I need it to remain stable—that’s the addictive properties talking. Benzos don’t mix well with certain medications and substances, especially alcohol, and stay in your system longer than you think. Sarra Sedghi is Paste Food’s assistant editor. She can usually be found arguing about mayonnaise on Twitter.